Surprise Egg Salvation...with Rainbow Rice! Is your toddler into the Surprise Egg videos as much as mine? Do they make you want to run screaming, and smash all the tablets in the house? Yes...me too. I've come to offer you salvation! Salvation for a mere $2.99 plus a little food coloring. It's all of the mysterious fun of a surprise egg without the annoying egg part. 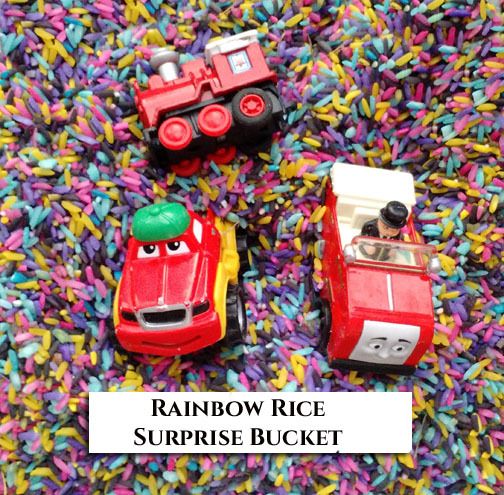 Rainbow rice is super easy to make. I like to dry mine in the microwave so it's a very fast, very simple project. To make the rainbow rice put 2-3 cups of dry rice in a zip top bag. Then add about 2-3 tsps of rubbing alcohol (you can also use vinegar, or water, but rubbing alcohol dries the fastest), and a healthy squirt of food coloring. Close the bag, and shake it up to coat the rice. 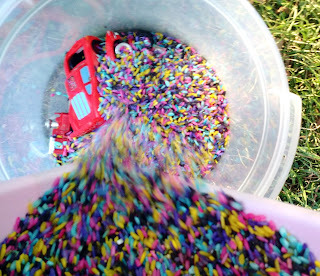 Dump the colored rice onto a paper plate, and toss it in the microwave for 1 minute. Take it out, give it a stir, and nuke it again for 30 seconds or until it's dry. It does clump together slightly, but the clumps break apart pretty easily. You can also just let this air dry. It's really about a 15-20 minute project, and then you can play for the rest of the day! Watch your darling be completely delighted with the same toys they thought were boring 10 minutes ago. Try not to cringe if they say "Click to subscribe at the bottom" , or "Thanks for watching". It's been a huge success! I think we made a total of 6 surprise buckets today. He played for HOURS with them, and the rice. 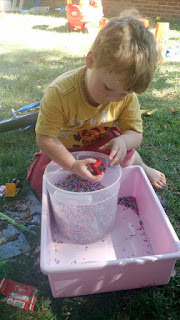 When they're done discovering their treasures the rainbow rice is a great sensory activity. Ali loves to play with it using his construction vehicles. 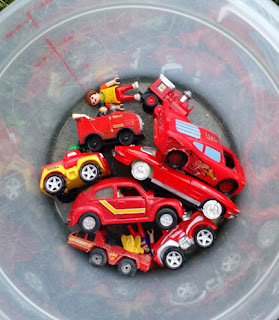 Give them some cups, and sand toys, and they LOVE it. Hi! Welcome to my personal blog! Every once in a while I make something cool, and post it here. You'd think I have enough creative outlets, but I HAVE to make something new every single day. Even if it's just toast.